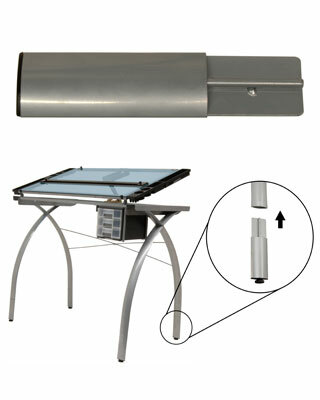 The Futura Leg Extension in Silver raises the height of Studio Designs' Futura Craft Station 6.25'' from 31.5'' to 37.75''. Allows for versatile work environment. Can work while standing or using drafting chair. Constructed of heavy gage steel for durability. Single pack includes 4 leg extensions. No tools required to assemble. Designed for Futura Craft Station in Silver/Blue Glass #10050. Also compatible with Futura Craft Stations #10070, 10071 and 10072.